Be the first to share your favorite memory, photo or story of Wauneta. This memorial page is dedicated for family, friends and future generations to celebrate the life of their loved one. 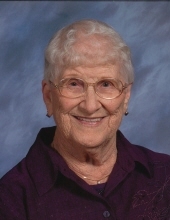 Wauneta M. Shaver, 98, of Fredonia, Kansas passed away Sunday, January 27, 2019 at Morningstar Care Home of Fredonia. Wauneta May Shaver was born October 1, 1920 in Fredonia, Kansas the daughter of Minor Gerald Thornton and Ida Myrtle (Crane) Thornton. She grew up in Fredonia and graduated from Fredonia High School in 1938. On May 11, 1940 in Independence, Kansas she was united in marriage to Francis Clifford Shaver and he preceded her in death September 8, 2000. She liked to have fun and when she played games with family and friends she did not like to lose. While playing cards with her husband they were called Lightning and Thunder. Wauneta was a member of the First Christian Church of Fredonia. Survivors include children, Larry Shaver and his wife Diane of Fredonia, Kansas, Karen Hoffsommer and her husband Gary of Overbrook, Kansas, Diane Kissel of Fredonia, Kansas, brother, Carl Thornton of Fredonia, Kansas, 11 grandchildren, 33 great grandchildren and 26 great great grandchildren. She was preceded in death by her parents, husband, sister in law, Dorothy Thornton and nephew, Carl Dean Thornton. Celebration of Life Funeral Services will be held 11:00 A.M., Saturday, February 9, 2019 at First Christian Church in Fredonia, Kansas. Friends may sign the register book from 10:00 A.M. until service time at the church. Memorial remembrances are suggested to the First Christian Church and they may be mailed to left at Wickham Family Funeral Home, 510 North 7th, Fredonia, Kansas 66736. To send flowers or a remembrance gift to the family of Wauneta M. Shaver, please visit our Tribute Store. "Email Address" would like to share the life celebration of Wauneta M. Shaver. Click on the "link" to go to share a favorite memory or leave a condolence message for the family.